This charging stand is beautifully designed, it’s well made, and it reflects Apple’s design aesthetic. It may not be something you really need, but use it for a while and you’ll appreciate its convenience. Your iPhone stands upright and even with a case on it, an adjustable rear support assures that it stands securely. Twelve South has two variations of the HiRise 2, the basic $40.00 version supplies the stand and the rear support. Three Lightning cable clips are included that allow you to use the stand with a variety of case thicknesses. The Deluxe version for $20.00 more, includes a MFi-certified Lightning cable, a micro-USB cable, and three additional cable clips. The HiRise’s main use is for charging your iDevices: all iPhones back to the 5 series, Apple’s new AirPods, Apple Pencil, and some iPads. Twelve South states that you can charge all iPad Airs, the iPad mini, and the 9.7” iPad Pro. True, you can but items that big standing upright on a very small platform make me nervous. I prefer charging those larger items by lying them flat on a desk or table. The base of the stand is satisfyingly heavy (0.5 lb. or .23 kg). 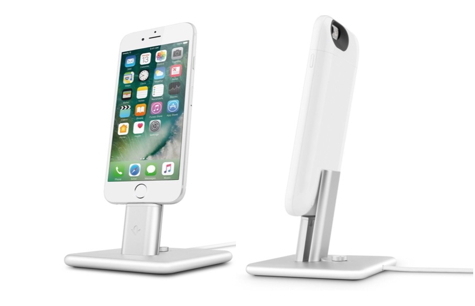 When you pick up your iPhone, the stand stays put. The iPhone is nearly vertical when it’s on the stand; it tips back only about 20 degrees. This makes it perfect for hands-free FaceTime or Skype calls. You’ll have to get used to using your iPhone at this angle and unlocking it with Touch ID is awkward. Reading Notifications, breaking news, and other alerts is very convenient though. 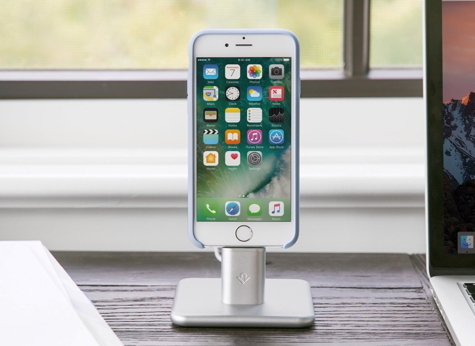 My preference is using the HiRise 2 on my desk where my iPhone’s screen is visible at all times, not on my nightstand when it might get knocked over. In keeping with Twelve South’s design abilities and build quality, the HiRise 2 is a gem. It charges your devices as intended and looks good doing it. Whether it’s right for you is a matter of taste, budget, and your work habits.